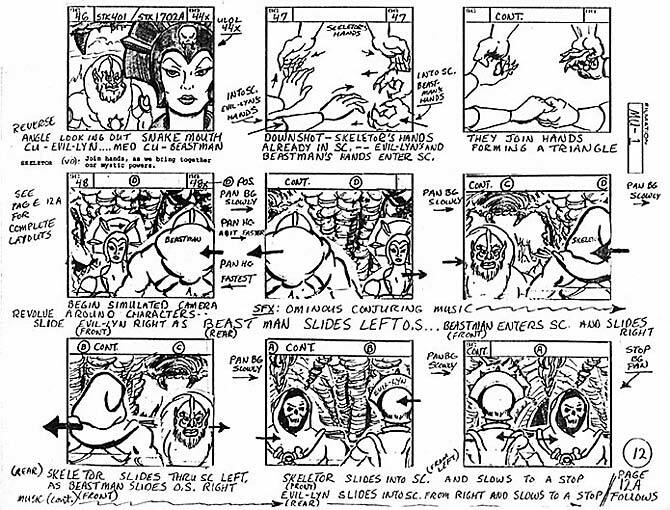 One last scene to compare storyboard to final scene is a pan of the interior of the Sorceress's Den in Castle Grayskull. "The Cosmic Comet" was the first story to go to script though it was not the first aired. That distinction belongs to "The Diamond Ray of Disappearance" which had the production number of MU-66004. The first script typically goes through the most rewriting as the series is in its early stages of development. When finally deemed ready for production, MU-66001 was released to the Storyboard Dept. in late April 1983. "The Cosmic Comet" was my second storyboard for He-Man. 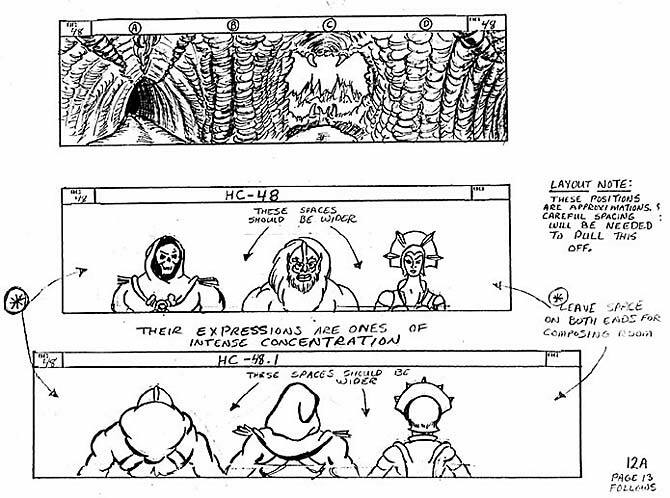 For my first He-Man assignment I had the privilege of boarding "The Dragon's Gift" written by Larry DiTillio which was numbered MU-66034. This gives some idea of how many stories were started before the first one went into production. At this time storyboard artists were given and entire script to board in 6 weeks: 4 weeks for the first draft and 2 weeks for revisions. As indicated in the storyboard route sheet above I made my 1st draft deadline within a few days. Other studios usually divided the scripts, assigning the acts to different board artists to meet accelerated production schedules. This plays havoc with continuity. Since Filmation utilized a stock and same/as system of recycling animation, it made more sense for a single board artist to stage an entire episode. I think it also makes sense from a quality standpoint as well. Since this was the first story written, it served as a model for subsequent stories. It opens with Skeletor's forces, namely Beastman and Evil-Lyn, attacking Castle Grayskull. This established the villains' primary objective and obsession. A scene that I boarded after He-Man thwarts the attack features a vertical pan from Evil-Lyn and Beastman in the mud at the base of Castle Grayskull up to the Jawbridge where He-Man, BattleCat and Man-At-Arms look down. The pan was trimmed for timing and just cuts from the bad guys in the mud to a medium shot of our heroes. At first I was annoyed because I wanted to show more of Castle Grayskull but it turned out to be a good thing. 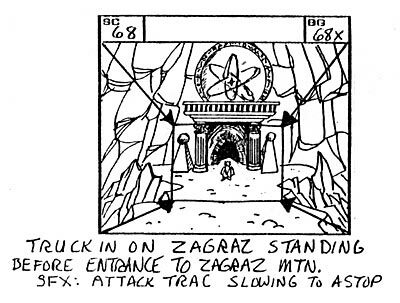 At this point in production it had not been established that there was a great bottomless abyss surrounding the castle. 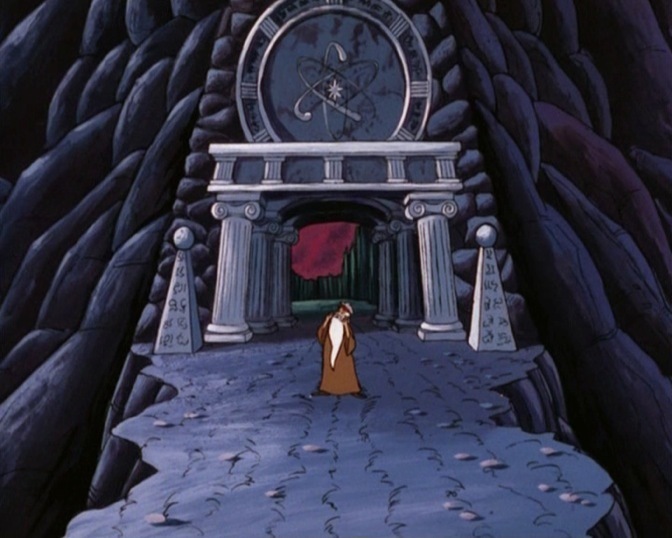 When I wrote my first script, "Into the Abyss," I got my wish to display more of Castle Grayskull and was glad this scene (at left) had been cut. “The Cosmic Comet” also features more sorcery with spell casting rather than just magical energy blasts than other episodes. 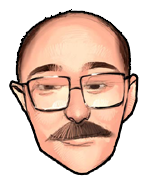 Larry DiTillio liked to feature magic in his scripts. Other writers weren't as comfortable and used magic powers like personal ray guns. To gain control of the Cosmic Comet, Skeletor has Evil-Lyn and Beastman join hands with him to "... bring together our mystic powers." (I don't know why Beastman was included since he is primarily a thug who controls animals.) For this sequence I wanted to simulate a 360 degree camera revolve a la Brian De Palma. I plotted it out in detail and, surprisingly, the scene made it through producer Hal Sutherland and Steve Clark, the director. There was only one problem: I gave the wrong direction for the background pan. As seen below, I indicated the bg should pan right but in reality it should have panned left to create the illusion of rotation. Oh well, it still looked good. Since this scene was more complicated than usual, I included a page for the layout dept. I liked the character design of Zagraz, the Keeper of the Comets. He looked like Merlin from Disney's "The Sword in the Stone" movie but sounded like the old radio comic Ed Wynn. I didn't like the concept of the comets having personalities and imputing our heroes "goodness" into a boulder in order for the Cosmic Comet to have its friend back. It also contradicted the idea that the humanoid creatures of the Cosmic Comet were not really alive. 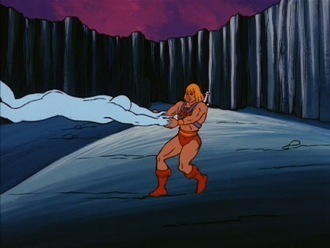 That was stated, of course, so that He-Man and Man-At-Arms could blast them to bits. 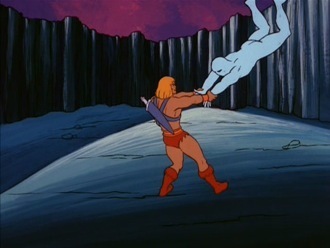 I thought the animation of He-Man swinging the comet creature around and tossing it was very well done. I would have liked the humanoids to continue glowing but that was a budgetary issue. 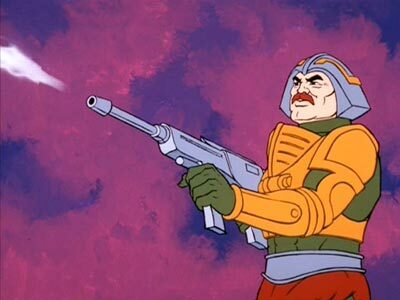 One thing that surprised me when I viewed this episode for this article was the weapon that Man-At-Arms wields. We had directives to not use weapons that resembled guns. In my storyboard I had him use a fist-mounted blaster. I don't remember ever seeing this weapon used again. Our heroes were on the ground a lot in this episode, especially Teela. 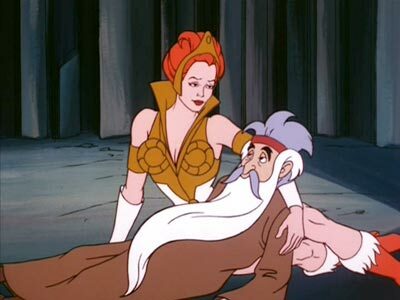 First, Teela with Prince Adam after she tackles him to save him from one of the comet creatures. It is a comfortable pose suitable for lounging at the beach. Next, Teela and Man-At-Arms recover from being knocked down or they could be at the beach as well. But then Zagraz kicks sand in Adam's face and takes his place on the towel with Teela. Overall I am very pleased at the realization of the scenes I composed in my storyboard for this episode. The layout artists, background artists and animators all did a superb job. Steve Clark did a fine job directing and timing the animation. It was because of this experience that I wrote a sequel called "Capture the Comet Keeper!" for the second season of He-Man and the Masters of the Universe.